Welcome to Cloud and Sun DJ and Wedding DJ Services in Sussex. I am a professional mixing DJ and I'll have you on the dance floor and tearing it up in no time! Most of my gigs are wedding discos, but I dj at all types of event throughout the average year and have been a DJ in Sussex since 2000. 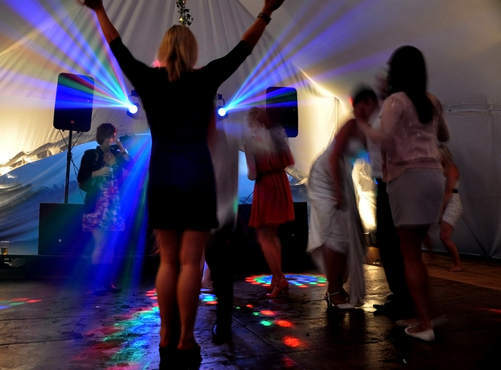 If you are looking for a chic, modern and stylish mobile disco for your party then you have found the right page. DJ Sussex - Wedding DJ Sussex – From 50's,60's,70's,80's,90's,00's hits to up-to-the-minute Current chart content seemlessly mixed together. I have the things you are looking for: A DJ with a passion for excellence in all aspects of sound quality and technique, A personal, friendly, tailored-to-fit Mobile DJ Disco service, total reliability of equipment and service, state-of-the-art, clear sound equipment with a huge current and back catalogue (click this link to bring it up in a seperate window) of songs from 50's hits, rock n' roll, Sinatra, Elvis etc. to 60's eg: Beatles, Wilson Picket etc. to 70's eg: Abba, Candy Staton, Sweet to classic 70's disco funk eg: Wild Cherry, Bee Gees, Quincy Jones etc. to 80's disco eg: Michael Jackson, Kool and the Gang, Chic etc. to new romantic: eg: Human league, Soft Cell, Nick Kershaw, kajagoogoo, Duran Duran etc. to 90's piano house, hip hop, r&b, House, funky house, tech house, pop, rock/indie, drum n' bass, grime, dubstep etc. right up to the current chart content and end of the night cheese all seemlessly mixed together, plus 100% style. Standard. FREE, no obligation consultation on your event. I am happy to take calls on enquiries, bookings, answer any questions and advise you on any aspect of your disco/event at any time, all in a polite and curtious manner. That's right. You get to talk to the same person who will DJ at your party. - How refreshing is that? Mobile DJ & Wedding DJ Sussex. Owner and proprietor of Cloud And Sun DJ Services. Book your wedding disco for 2019 and beyond! Places are filling up. Prices are the best value in Sussex!